I talked briefly about the advantages of managed switches for your small business network, but in this post I’ll give you more information about both managed and unmanaged switches, so you can decide which is best for your company. A managed switch, such as the Cisco 300 Series lets you prioritize the traffic traveling across your network so that the most important information gets through first. In addition, you can control who has access to your network. With a managed switch, you can configure, manage, and monitor your network. Managed switches use SNMP (Simple Network Management Protocol) to show you how well your network is running and if any of the devices on your network are broken or failing. SNMP also provides remote management capabilities, enabling you to make changes to the devices on your network and repair any problems through the Web-based interface, without having to directly connect to the switch itself. Managed switches also provide redundancy and VLAN (virtual LAN) capabilities to help improve your network’s performance. Redundancy allows the switch to keep network traffic flowing even if a network connection fails. In other words, your network won’t go down. VLANs let you create groups within your company to isolate different kinds of traffic on the network. For example, you can segment traffic between your finance and marketing groups so that mission-critical financial information has priority over marketing data. VLANs also provide an additional layer of security by letting you hide sensitive company information from guests you’ve allowed to access your network. Finally, a managed switch can support you as your business and technology needs grow. For example, if you decide to adopt an IP-based phone system, having a managed switch with QoS (Quality of Service) support allows you to assign a higher priority to voice traffic so that call quality isn’t affected by other traffic on your network. Additionally, a managed switch that includes secure wireless connectivity lets you add users—employees and guests—to your network at any time and allow them to access your network and the Internet from any office or conference room in the building. An unmanaged switch has fewer features than its managed counterpart, so it requires little technical know-how to add to your network. There’s no software to install and nothing to configure, making an unmanaged switch ideal for small businesses that are just getting their network started or that have no in-house IT support. 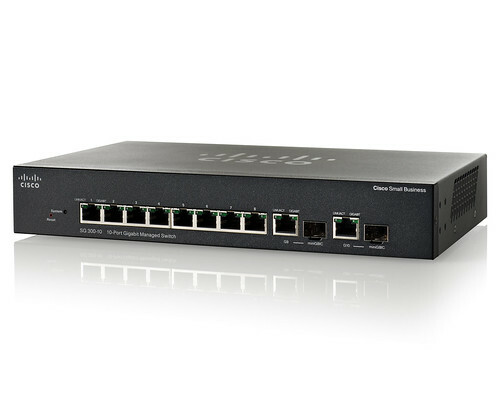 Unmanaged switches, like the Cisco 100 Series, have a fixed configuration and are ready to communicate with your PCs, network printers, and other devices right out of the box. All you have to do is plug in the switch, connect your computers and other devices to it, and connect the switch to the Internet. That’s all there is to it. Regardless of which type of switch you choose, make sure it has all the basic must-have features. These include energy efficiency, interoperability with other vendors’ products, and Fast Ethernet and Gigabit Ethernet connectivity. Have you recently purchased a switch? Which did you choose and why? Share your tips with other small businesses.